Scars:Cross shaped scar on his left cheek and a deep scar from his right shoulder leading down his chest. Tattoo:A half sleeve tribal tattoo on his right arm covering his right chest and upper back. Central Pillar: He was born in his fathers home country, The Republic of Atheon. While his mother hailed from the Inonaka Kingdom. Both on the opposite end of the continent. Contrast Pillar: Born of a forbidden love, Slade has endured may assaults throughout his life. Both physically and mentally. Active Pillar: After studying the various forms of energy Slade wanted to share his personal findings with the youth of the Chaos. So, while he continues to be a defender of the Chaos he also teaches the youth. Crossing Pillar: After coming to the chaos his caring nature has earned him many allies. Among them the leader of the chaos Zeik Hellgate. True Sight: A visual ability he inherited from his Ieshida bloodline. It allows the user Telescopic vision when focused, and and a full 360 degree field of vision when relaxed. The user is also able to see all energy on a different visual spectrum. Skill Description: The user releases a protective layer of energy around their entire body. The cloak is initially invisible to normal eyesight But can become more opaque with more energy used. The more energy used in the technique the thicker it becomes. This can also be used to create energy weapons or other metaphysical manifestations from their body. Skill Description: By using his own energy or the elements around him Slade can create needles out of literally anything he can sync his chakra with. And using this in tandem with his true sight this technique can be used with pinpoint accuracy. Skill description: A style of hand-to-hand combat that aims to inflict internal damage and disrupt a body's Personal Energy Pathway System so as to ultimately inhibit an opponent's use of energy. To do this, the user surgically injects a small amount of their own energy into an opponent's pathway system. The infiltrating energy can then be used to rupture or divert energy flow, preventing them from using abilities. Skill description: The user forms two large shrouds of energy around their hands in the shape of Dragon heads, then thrusts them forward at the opponent. These can be used as projectiles or as combative gauntlets. Its power is easily ten times that of one his normal strikes. 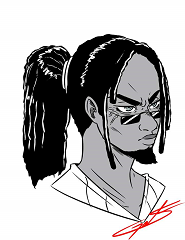 Skill description: With his ability to see energy in a spectrum Slade learned how to manipulate his own energy to match the element. with this ability he has been able to use any element available to his advantage.